But the people were displeased. “He [Jesus] has gone to be the guest of a notorious sinner,” they grumbled. The time of day is not specified in the verse above. I have set this scene in the early afternoon. Sunlight from above left illuminates this scene, casting shadows to the right. Jesus (in blue) is in the background, with Zacchaeus. 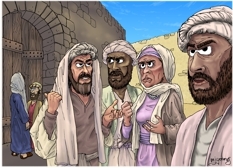 Four Hebrew people (unnamed) are standing in the foreground. They are the grumblers of the title! 01) (This page) Luke 19 – Zacchaeus the tax collector – Scene 06 – Grumblers (Colour version). This version doesn’t have the strong cast shadows and sunlight present on the foreground figures. 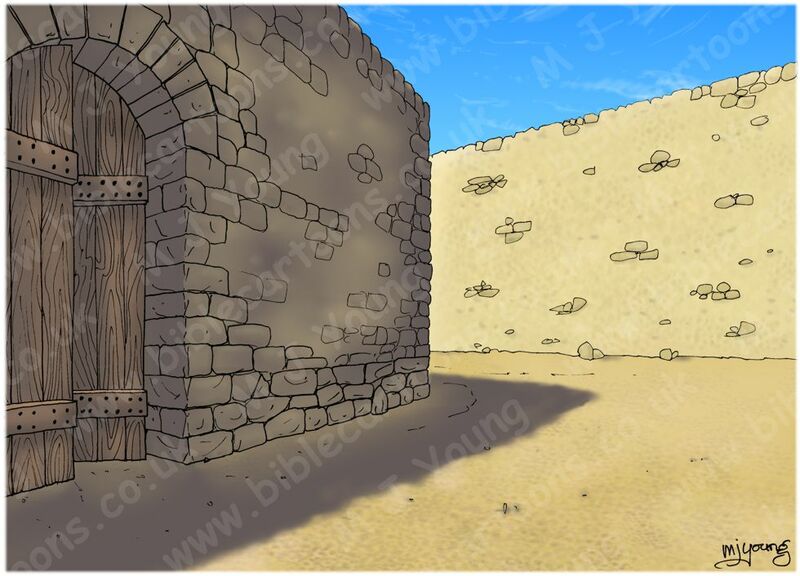 02) (Next page) Luke 19 – Zacchaeus the tax collector – Scene 06 – Grumblers (Sunlight version). This scene contains strong sunlight and cast shadows covering the foreground figures. I enjoyed drawing the grumpy looking expressions on the people in the foreground of this scene. I had to take photo’s of myself in those postures to get them right! The woman with raised fist & murderous expression came out very well!